Join the San Bernardino County Library as we partner with Bakers Drive Thru to promote reading among children and teens this fall. This eight-week reading program will begin Monday, Oct. 6, 2014 and run through the weekend of Nov. 22, 2014. The San Bernardino County Library and Bakers Drive Thru are very excited to host this first ever fall Book Club to promote reading among children and teens just as the school year is beginning preparing them for literacy success for the rest of the school year. Participation in the program is easy! Visit any of our 32 County Libraries to sign up. Participants must be between the ages of 4-17 and a parent or guardian must sign off on the reading log. Children will be able to reach three reading incentive levels and win prizes provided by Bakers Drive thru by logging in the number of pages read in their log. Awards vary on the level each participant achieves but includes certificates for free Hand-dipped Real Ice Cream Milkshakes; bean burritos, fries and a drink; single baker and Hand-dipped Real Ice Cream Milkshake. Every participant who reaches level three will be entered into an opportunity drawing for a chance to win a Kindle Fire HD. The program officially opens at all San Bernardino County library locations on Monday, Oct. 6, 2014. 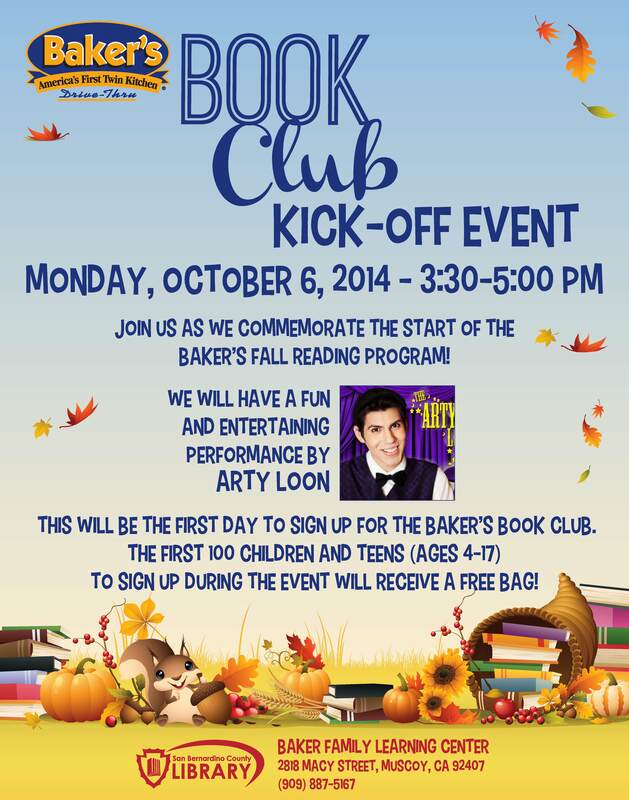 The Baker Family Learning Center at 2818 North Macy Street in Muscoy will be hosting a special kickoff event at 3:30 p.m. Monday, Oct. 6 including a special presentation acknowledging this amazing partnership with Bakers Drive Thru, a performance by Arty Loon, followed by sign-ups to Bakers Book Club. The first 100 children and teens to attend the kick-off event will receive a free bag! For further information regarding this event, please contact Liz Smith at (909) 387.2273. Click here for reward details on the Book Club program.